As the American headquarters of Anheuser-Busch InBev and the birthplace of Budweiser, St. Louis has long been seen as a bastion of big beer. But a number of well-respected smaller breweries have recently opened within the city limits alone, with more coming online soon across the metro area. All told, there are more than two dozen brewers of various sizes in the area, with many offering full menus, a bierhall atmosphere, or cozy tasting rooms tucked in some of the city’s most historic or newly burgeoning neighborhoods. 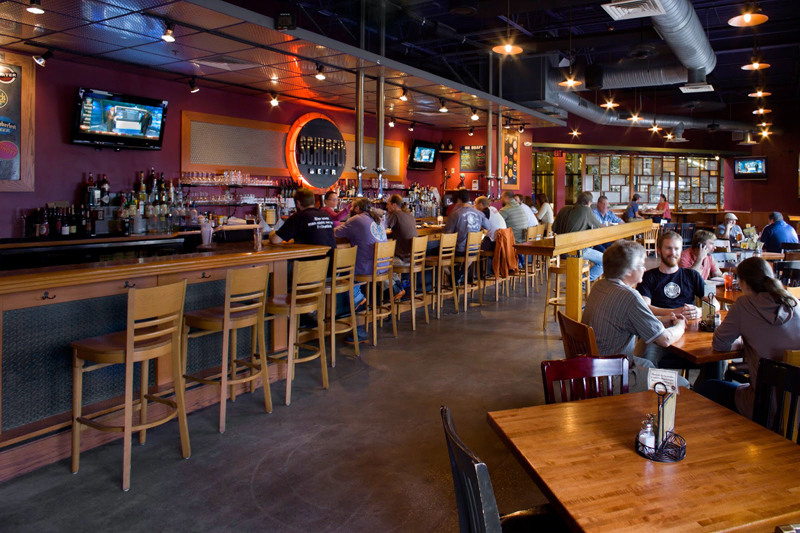 Urban Chestnut Brewing Co.’s Grove Brewery and Bierhall (4465 Manchester Ave.) just opened at the end of February in the funky Grove neighborhood, so tables are typically packed on weekend nights. But afternoons offer excellent time to snag a prime spot at the bar or one of the long, communal tables offering a view of the brewhouse. The menu is partly populated by Euro comfort food like schnitzel and knuckle sandwiches, and the beer selection showcases German classics including the brewery’s flagship Zwickel, a yeasty Bavarian-style lager. Drinkers will also discover drafts, like the Hopfen—which UCBC bills as a “Bavarian IPA” built on Hallertau hops—that aren’t easy to find elsewhere on tap. Everest Café & Bar (4145 Manchester Ave.) serves Nepalese, Korean and Indian food. Its owner and executive chef, Devi Gurung States, holds a doctorate in public health and founded a nonprofit called the Himalayan Family Healthcare Project to deliver primary care to families in the economically depressed Himalayan region of Nepal where he grew up. Not surprisingly, the food at Everest is light, fresh and perfectly seasoned with a profusion of exotic spices. While the beer list is short, it offers easy-drinking imports including Sapporo and Tsingtao as well as a few local selections like Schlafly’s Hefeweizen, a light, citrusy unfiltered wheat. Try the sizzling tarkari—kind of a Nepalese take on fajitas—that won’t slow you down on the dance floor and will provide a perfect palate for more beers. After checking out some of the many live music venues or dance clubs in the Grove, end the night at HandleBar (4127 Manchester Ave.), which is open until 3 a.m. and features a wide selection of bottled beers and 20 beers on tap (a dollar off drafts on Friday). There are plenty of distractions both on the walls and off at this colorfully appointed bicycle-themed bar where the bartender will remix your dark and stormy if the storm doesn’t brew properly and then drink the cast-away cocktail himself. Drinkers who want to stick with beer can choose from a wide variety of local offerings like 4 Hands Single Speed Session, an American blond ale with a pleasantly pronounced jasmine finish. HandleBar also offers a menu of appetizers, Russian-inspired crepes and pizzas for those who work up an appetite dancing to the DJ’s tunes. But, pace yourself, the kitchen closes at 11 p.m.
Start the day at Strange Donuts (2709 Sutton Blvd. ), which offers classic confections like long johns and fritters. But the real draw are tasty creations like the Strange bacon doughnut or and the gooey butter, a doughnut-lover’s take on the city’s specialty—gooey butter cake—that serve as the perfect fuel for a little shopping in Maplewood, the hip suburb that’s home to the main brewing facility of the Saint Louis Brewery, the makers of Schlafly Beers. Schlafly Bottleworks (7260 Southwest Ave.) offers a behind-the-scenes brewers’ tour from 10 a.m. to noon on the third Saturday of each month, but those who don’t score a $20 ticket can attend a free hourlong session offered several times every weekend that includes an overview of the brewery’s history, a look at the brewhouse and bottling machinery, and a tasting tour of three beers currently on tap. The tour always includes a sample of the pale ale and rotates in other offerings, like crisp, grassy kölsch. Have lunch at the restaurant, which features a weekend brunch and showcases Schlafly beers as well as produce grown in the on-site garden. Explore the Missouri Botanical Garden (4344 Shaw Blvd., general admission $8). Founded in 1859, the garden is the nation’s oldest botanical garden in continuous operation and a National Historic Landmark with a 14-acre Japanese Garden that’s one of the largest in North America and recently underwent a restoration of its beautifully intricate bridges and waterfalls. From there, head to Perennial Artisan Ales (8125 Michigan Ave.) where, earlier this year, people lined up for a ticket that entitled them to eventually purchase some of the brewery’s barrel-aged Abraxas, an imperial stout aged for a year in Rittenhouse Rye barrels. On the typical weekend, visitors won’t face lines out the door at this low-key tasting room and brewery, where regular offerings include the Saison de Lis, a French-style saison that’s flavorful, but balanced enough to serve as a session beer. And most will want to have more than one beer at Perennial, the kind of fun, family-friendly spot where a visibly pregnant bartender offers one of about eight drafts or four bottled beers as well as advice on how to avoid crowds later that evening in the Soulard neighborhood. In the evening, visit The Civil Life Brewing Co. (3714 Holt Ave.), another relaxed room that offers about a dozen beers of various styles by the taste, half pint or full pint as well as a small menu of snacks and sandwiches. The upstairs seating area of this cash-only tasting room affords a bird’s-eye view of the brewhouse and a selection of dusty games and books culled from someone’s college bookshelf to help pass time between pints of velvety Milk Stout. Have dinner at Bogart’s Smokehouse (1627 S. 9th St.), which offers ribs basted in apricot brûlée, burnt ends and other delicious delicacies (but no beer) ’cued with care by executive chef and pit master Skip Steele. Steele is the type of Southern gentleman to come out and call folks sitting at the picnic tables outside his “new friends” without a hint of irony. It’s true that, once you’ve been to Bogart’s, you’ll want to come back, as evidenced by the lines that frequently snake around the corner of the small restaurant. To skip the queue, call in your order, which should definitely include a side of deviled egg potato salad. Sample the Soulard neighborhood’s nightlife at any number of bars and live music venues in this historic, party-friendly ’hood that hosts one of the country’s largest Mardi Gras celebrations and where you’re likely to see a string of beads near the sidewalks well into May before heading to International Tap House (1711 S. 9th St.), which features local bands, 44 beers on tap and as many as 500 bottled offerings. But bring your own late-night snack. The only food you’ll find is a box of Milk-Bone biscuits for furry, four-legged friends sitting on the dog-friendly patio. Explore the Saint Louis Art Museum (One Fine Arts Drive, Forest Park), which opened its East Building expansion, featuring 21 new galleries, last year. The austere design of the new space is particularly fitting for the contemporary art collection, which boasts bold works by Chuck Close, Roy Lichtenstein, Pablo Picasso and Jackson Pollack. Like many other attractions in the city, general admission is free and parking is typically easy to find in one of the gratis lots or in the surrounding 1,200-acre Forest Park, home of the 1904 World’s Fair. On the way out of town, visit Baileys’ Range (920 Olive St.), which features burgers crafted from Missouri grass-fed beef or just about anything else you can fit between buns. The deceptively concise one-page menu allows eaters to build their own burger or substitute any protein—and even a vegetarian option—for the selections outlined on the menu, which includes intriguing burgers like the Scotch Egg, a boiled egg-filled pork patty topped with cheddar, bacon and spicy beer mustard. With around 30 exclusively local beers to choose from, including 2nd Shift Brewing’s Katy—a tart, tasty Brett aged in oak barrels, it’s easy to find the perfect pairing for anything you create or crave, but diners with a sweet tooth might want to save room for dessert. Baileys’ Range makes its own ice cream and even offers a selection of “boozy” floats and shakes.